For further information please click the required service button. A clinical examination reveals the general state of your pet’s health and helps us to identify problems. If more than a normal examination is necessary to find out what is wrong with your pet, it tells us what further tests will be required, which we will discuss with you in detail. Many animals are fairly happy to sit on the examination table. Others, for example larger dogs or rabbits with a tendency for panic reactions can be examined on the floor. Some cats prefer to sit on the window sill looking out while being examined. Tell us if your pet has special preferences. Vaccination has changed quite a bit over the recent years. On the one hand the interval between vaccines has in many cases been extended, so that revaccination is necessary less frequently. On the other hand several of the life threatening diseases that we vaccinate against and that may be harmful not only to pets, but in a few cases also to humans are actually more commonly seen again. Because of that it is very advisable to have your pet protected with the necessary core vaccines. In some cases additional vaccinations are advisable, too, such as leukaemia vaccine in cats. 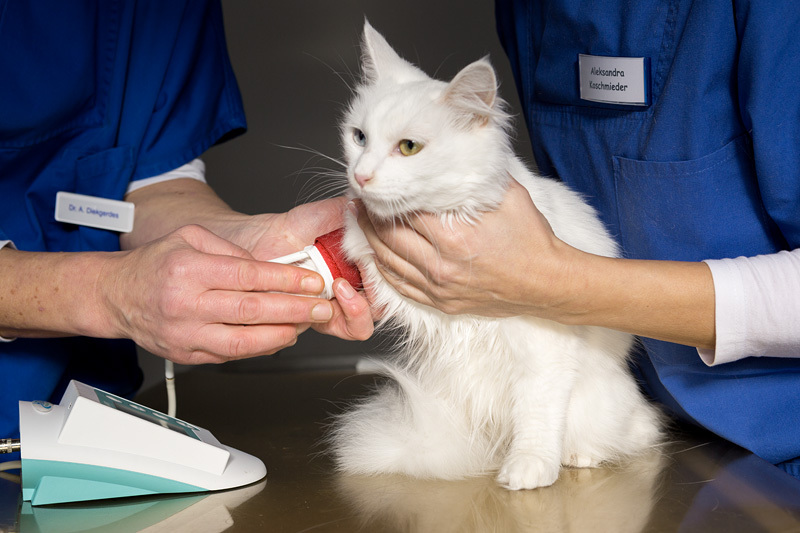 We are happy to advise you which vaccinations are necessary for your individual pet. 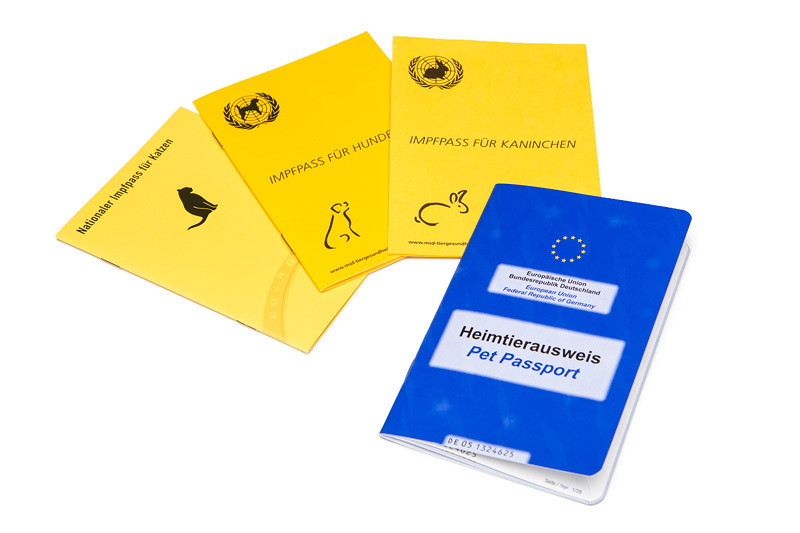 Should you wish to travel abroad with your pet, we are happy to provide your pet with an International Pet Passport, which is required for travelling outside Germany. 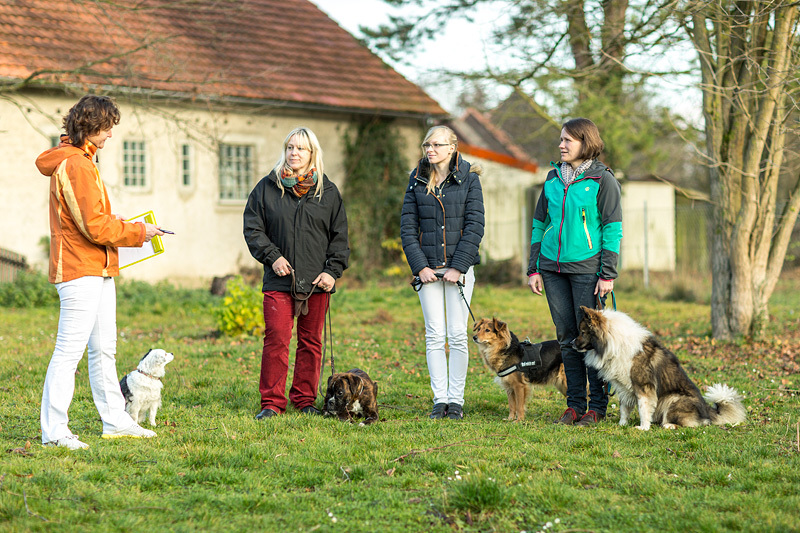 Microchipping is mandatory for dogs in Lower Saxony, but not necessarily in other parts of Germany. 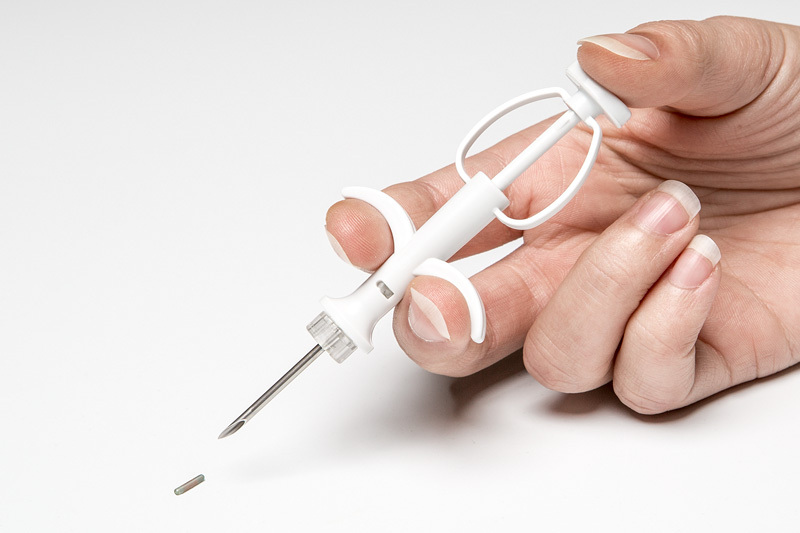 Microchips are now much smaller than they used to be and are simply injected under the skin. Many animals do not even seem to notice the injection. Each chip is furnished with a unique number, which can be picked up easily with a chip reader. There is no obligation to microchip cats and other pets, however, it may still be a good idea. An animal with an individual chip number will not end up in a shelter, as the owner can be identified immediately should it be picked up as a stray. In addition, there are now cat flaps operating with chip numbers to make sure no other animals enter your house or even feeding bowls to make sure that only certain pets have access to certain food. A multitude of creeping and crawling animals try to take shelter inside or on the outside of our pets. That is at best uncomfortable and may even be dangerous. Some of those parasites are not picky and may affect humans. You can either keep them at bay by giving your pet regular preventative treatment or can have your pet’s faeces and skin tested regularly to make sure that no-one has moved in. 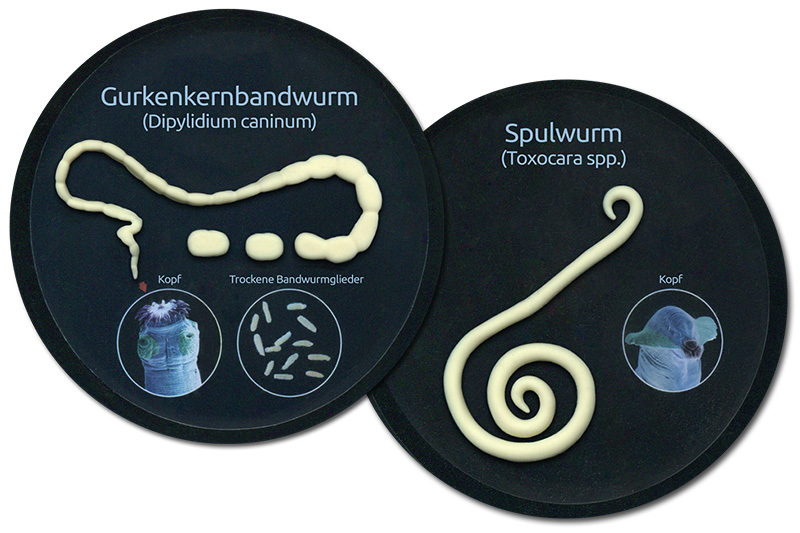 There is a multitude of options to prevent or treat parasitic infestations that are safe for your pet when used correctly. Travelling with your pet can be an amazing and memorable time. However, you only want to have good memories afterwards! Therefore some preparation before the journey is required. Apart from deciding how to make sure that travelling in itself and the time at your holiday destination is enjoyable to your pet, it is advisable to pack a little first aid kit. Bureaucratic pit falls have to be avoided, too. An International Pet Passport is mandatory whenever you plan to cross a border with your pet, but depending on your destination other requirements may have to be fulfilled, too. 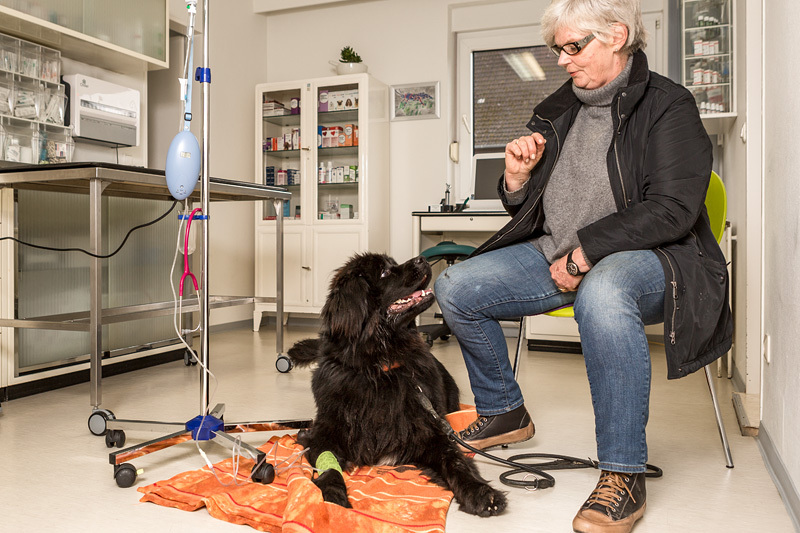 It is also necessary to be informed about parasites and diseases that are not prevalent in Germany, but may affect your pet while travelling. This varies from country to country, so it is advisable to discuss travelling plans with us well in advance. We are happy to discuss legal, health and other issues to make sure you will have a relaxed journey. If you acquired your dog after the 01 July 2011 you are legally required to obtain a Certificate of competence. In our practice you can take the theoretical and practical part of the examination in a relaxed and friendly atmosphere. It is frequently not possible to diagnose diseases of the internal organs only by a general examination. Further tests are required to find out what is wrong with your pet. Very often you, the owner, plays an important part, too. Because our patients cannot talk, your observations may aid our decision, which direction the diagnostic process has to take. It can also help very much if you provide us with samples of unusual faeces, urine – or pictures and short videos showing the symptoms of your pet. 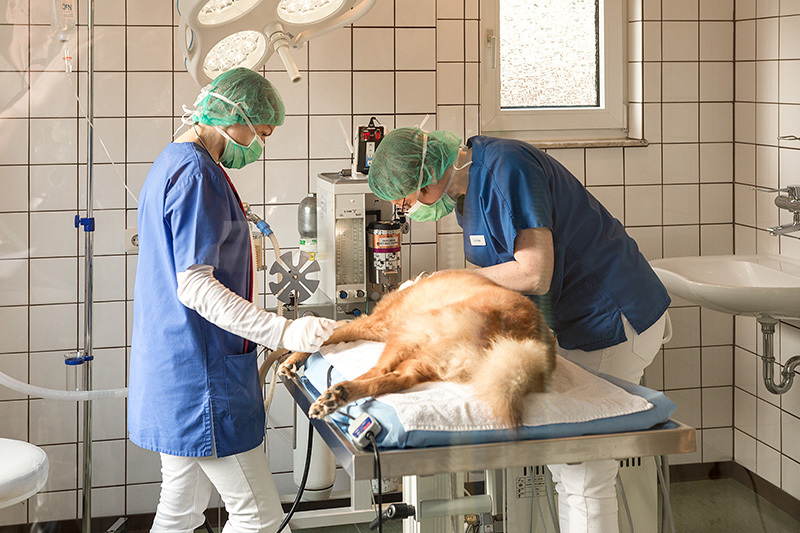 Hearing that your pet requires surgery under general anaesthesia is worrying for most owners. We are aware that by operating on your pet we take on an enormous responsibility. However, these days various anaesthetic options, including inhalation anaesthesia, reduce the unavoidable risks very much. Of course, each patient under anaesthesia is very carefully monitored at all times. Our practice has a dedicated operation theatre which is set apart from the rest of the practice. This helps to maintain the necessary hygiene and gives us the peace and quiet that is required for concentrated work. X-ray pictures are a great way of showing bones and also teeth in great detail. However, they also give us a good overview over the organs in the thorax and abdomen. In most cases, a sedation of the patient is not required however some pictures are only possible with the animal being asleep. Before each radiographic exam we will discuss with you, what is necessary in the case of your pet. 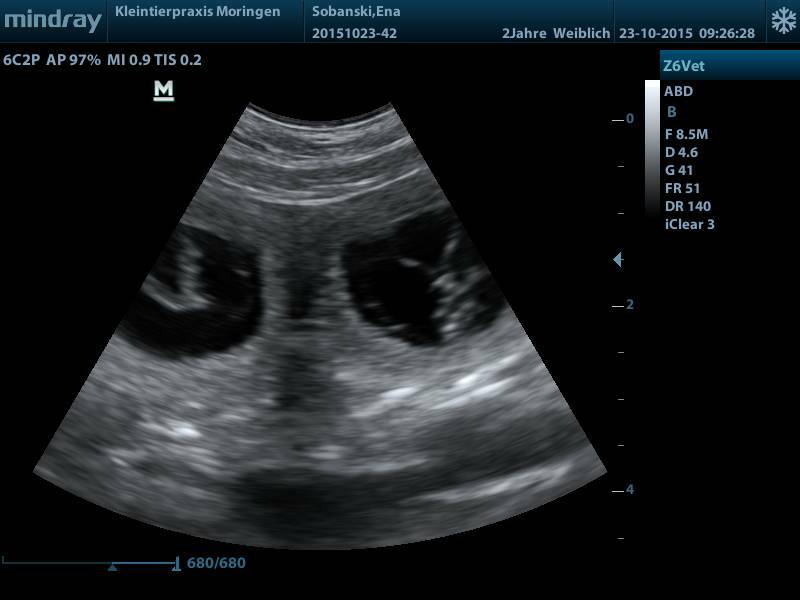 With an ultrasound examination we are able to investigate the internal organs further. Information about size, position and structure of the organs help us to identify problems. Pregnancies can be detected and the motions of the heart can be seen directly. Ultrasound exams are painless and there is no issue with radiation. Sedation is only very rarely necessary and many animals find the process quite relaxing after a while. A multitude of exanimations are possible to show us what is wrong with your pet. 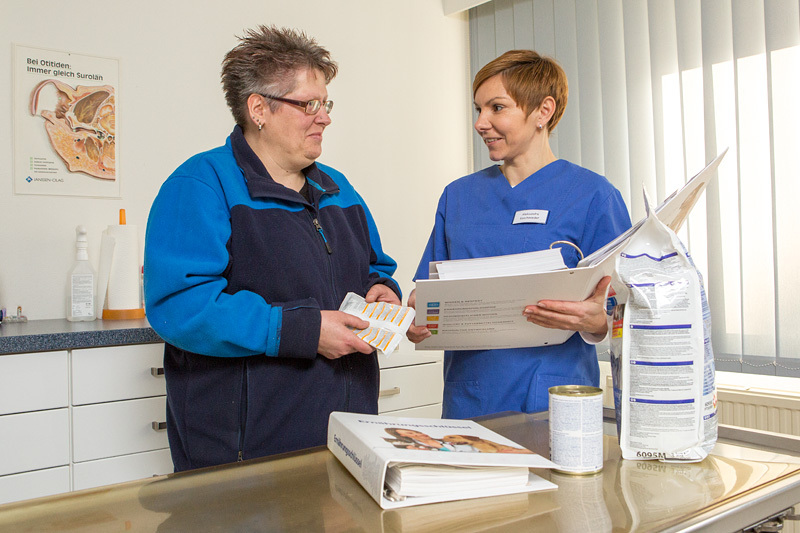 Some of them can be done directly at our practice, for example skin scrapes or some tests with urine, faeces and blood. 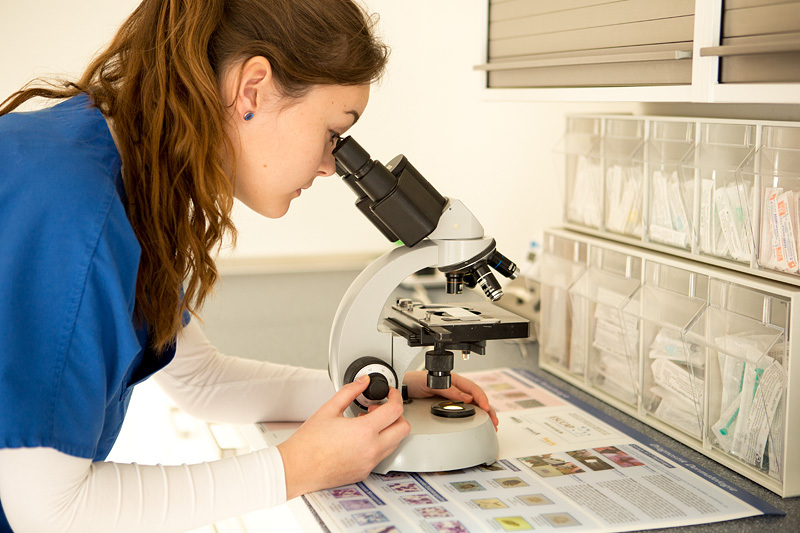 However, to get high quality answers, for most tests samples are send away to a qualified veterinary laboratory. A lot of us will have trouble with blood pressure at some time in our lives, whether it is too high or too low. Some of our pets will develop similar problems and like in humans, this may well be overlooked for a long time, but will cause problems in the long run. Unlike humans, most animals have an underlying disease process leading to blood pressure problems, so if your pet shows up with a blood pressure issue, we will discuss further investigations with you to identify the underlying problem. Skin disease can be quite disfiguring, but more importantly, it often itches or is painful and is so very uncomfortable for the animal. As the skin has only a limited possibility to react to various triggers, it is often impossible to distinguish between diseases just by clinical examination. Further tests and again your exact observations of your pet`s clinical signs are important to reach a proper diagnosis and treatment plan. Healthy teeth and gums are important fort the general health of your pet. 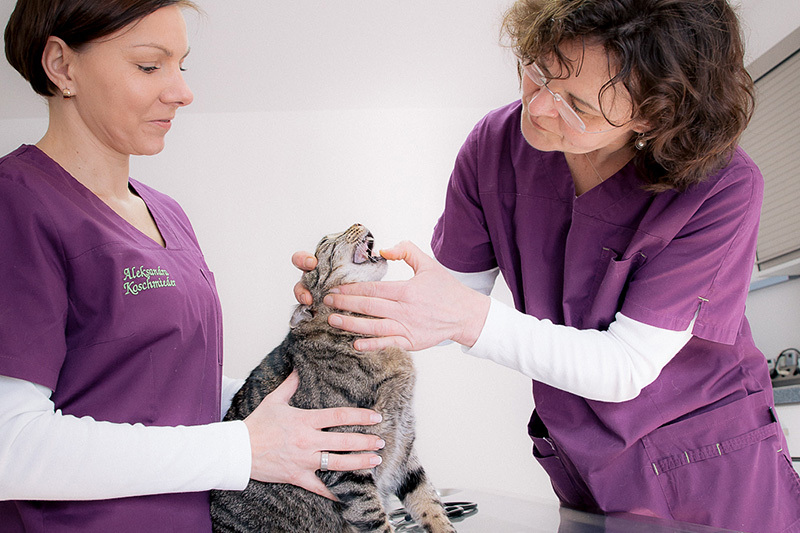 After assessing your pet´s dental health we will discuss what has to be done. 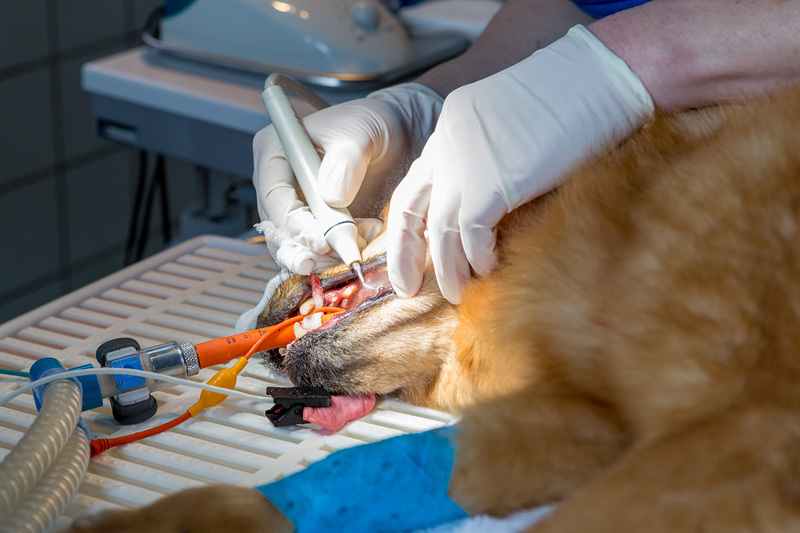 Anaesthesia is necessary for complete and thorough dental treatment, which includes removal of tartar by ultrasound scaling and polishing of the teeth afterwards. Diseased and painful teeth are removed at that time. Dental health is also extremely important for rabbits and other small mammals. Problems are often only noticed when the pet starts to lose weight. There is some wear and tear over the years! Some consequences are obvious and may not be very problematic, others may develop slowly and more secretively and/or may affect the animal´s quality of life more than you may be aware of, such as chronic painful conditions. Many pets suffer in silence for a long time, after all, they do not know that something might be done about it. Certainly everyone is much happier once the problem has been discovered and dealt with. Please approach us if you would like a check up for your elderly pet or even suspect a certain problem. The multitude of different options and philosophies about how to feed your pet properly can be quite confusing for owners, who, after all, just want the very best for their pet. There is more than one answer to this question, and we are happy to discuss your individual situation and views to find a way to keep both you and your pet happy.